And what she’s leaving behind is the Gary and Mary West Senior Dental Center, in the Serving Seniors’ Gary and Mary West Senior Wellness Center, which celebrates its second anniversary next month. The non-profit provides affordable oral health care, education and services to seniors in need. 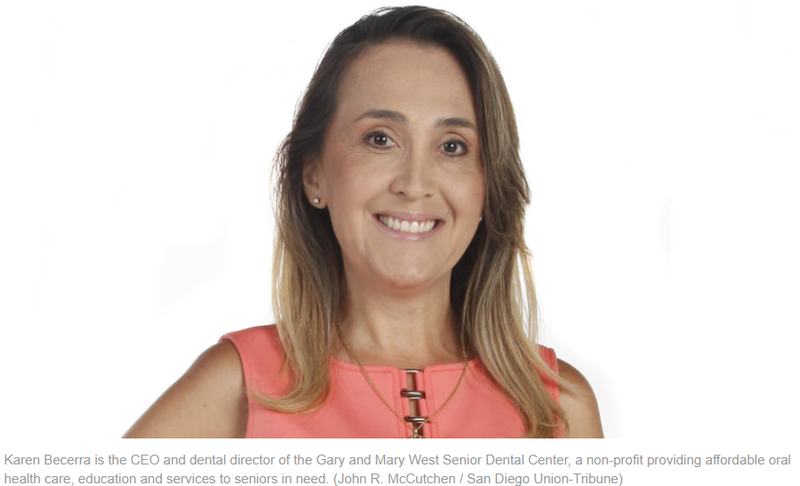 Becerra, 45, is the CEO and dental director of the center and lives in Escondido with her husband, their daughter and her mother. She took some time to talk about the center, helping seniors, and her passion for helping people improve their oral health. Q: Why did you want to become a dentist? A: I have always had a deep desire to help others. I care deeply about alleviating people in pain and dentistry was a natural fit for me as it allows me to be empathetic and artistic at the same time. Q: Tell us about the Gary & Mary West Senior Dental Center. A: Our mission is to provide affordable, high-quality oral healthcare with comprehensive education, clinical and wellness services for seniors in need, enabling them to live healthy and productive lives. The Gary and Mary West Senior Dental Center has been open for two years now, but it took over a year to plan and execute the center. We offer oral health services that help control pain and infection and enable seniors to regain their teeth function. The clinic is part of a new, integrated model of care for older adults, and it was designed to provide coordinated care in a more holistic fashion. We also offer educational classes, in three different languages, to address the different needs that our seniors have. Q: You started out volunteering at the Gary and Mary West Senior Wellness Center and noticed that many seniors couldn’t eat the meals you were helping serve? Why couldn’t they eat them? A: I volunteered serving meals at Serving Seniors’ Gary and Mary West Senior Wellness Center and saw many seniors missing teeth and selectively eating just the mashed potatoes and the soft foods provided. They were unable to eat some meat or anything that might require actual chewing. Despite being able to access a nutritious meal, they had so many oral health issues that they just couldn’t access all the food and that was very sad. One day, I was talking with Mary West during one of her cooking classes at the center and a senior came talk to us, but we couldn’t understand anything she said. She was embarrassed and covering her mouth as her teeth were in such disarray. Mary had always been very concerned about the seniors’ oral health, as many looked so sad and unable to eat or even speak.